John D Rockefeller began as a humble oil business book-keeper in Cleveland, Ohio and in just seven years rose to control a tenth of the entire US oil business. In the late 19th century the oil industry was a free-for-all, the law of the jungle ruled. Rockefeller used this 'individual freedom' to pursue several extremely successful and deceitful tactics to accumulate capital. He would secretly buy up or create new oil related companies such as engineering and pipeline firms. These seemed to be independent operators. Rockefeller and his close colleagues secretly controlled the firms and gave Standard Oil, Rockefeller's main oil company, hidden rebates. Another tactic was to buy up a competing oil company, again secretly. Officials from this company could then be used very effectively to spy on, and give advanced warning of, deals being hatched by his real competitors. Almost certainly the most lucrative secret deals done by Rockefeller and his partners were with the railroads. These 'in harmony' deals meant those refineries and oil traders not 'in harmony' with standard would find that railroads would refuse point blank to move their oil, whatever the price. Oil, of course, is free at source, so once the investment in refining and extraction plant has been made the only really important cost was transportation. Rockefeller's secret railroad rebates on the transportation of his oil kept his competitors guessing for years. None of them could understand how he kept pump prices so low. They were all bemused that Standard Oil had being growing at such a rate. How he managed to persuade the railroads to give him rebates and keep the deals secret is still not clear. Allun Nevins has produced an official biography¹ of the Rockefeller empire but even he cannot help but question its morality. Of a railroad contract signed on 17 October 1877 he says, "The commission was excessive for the services performed. It was ethically indefensible." "Today," he says, "we must condemn the misuse of power not only as a crushing blow to the company's competitors but as an indirect tax on the public." At judicial enquiries such as the Hepburn Committee, which delivered its report on January 22nd 1880, Standard Oil representatives and those 'in harmony' were tight lipped. They often refused to attend court hearings and regularly disputed its validity. They would give disdainful, condecending replies to the examiners which spoke of an seeming immunity to the rule of law. The committee decided that "Standard Oil violated... social justice" in its monopolistic deals with the railroads. Standard Oil had its own intelligence and espionage service. Rockefeller saw that a little knowledge can be decisive in the business world so he combined this good supply of information on his competitors with a total wall of silence he himself presented to the outside world. 'No comment' was all that journalists came to expect from the Standard offices. But what about the man himself? Old film of John Rockefeller shows him moving in a curiously stiff and wooden fashion, expressionless. He proffessed to being a Baptist and went to church regularly, but did he enjoy it? Anthony Sampson in his book 'The Seven Sisters' quotes John Rockefeller as having a favourite maxim; 'Don't let good fellowship get the least hold of you'. Jerome Greene called him, "the most unemotional man I have ever known". One shadowy deal that Standard Oil of California (or SOCAL) struck back in the 1930's changed the face of urban America for ever. The Firestone Tire and Rubber Company, Phillips Petroleum Co., Mack Truck and General Motors collaborated on a project with SOCAL called National City Lines. The tram systems in the urban US were suffering from under-investment and often crippling debt repayments so National City Lines stepped in across the States to liberate the populous from their cheap and cheerful old 'streetcar' systems. They were replaced with motor buses or they were gradually closed down completely. The demand for motor cars soared returning massive profits for all involved in the deal. By 1940 General Motors alone had been responsible for the disposal of more than 100 urban streetcar operations. In the late forties the consortium was found guilty by the federal grand jury under anti-trust (anti-competitive) legislation but the $5,000 fine was laughable. It did not even amount to the annual profit returned from the conversion of a single streetcar. National City Lines sold the dream of the bus and the car to businessmen and politicians right across the continent. In Detroit, even the chairman of the rapid transit company declared the car as the 'magic carpet of transportation for all mankind'. Mayor LeGuardia in NYC said the car represented the best of modern civilisation, whereas the tram was simply an old-fashioned obstacle to progress. So where are the Rockefellers now? The current head of the family is David Rockefeller, Chairman of the Chase Manhattan Bank and prime mover in the secret 'Bilderberg' and 'Trilateral Commission' elite groups. His personal secretary, Alice Victor, was one of the only woman present at the 1996 covert Bilderberg meeting just outside Montreal. Amongst the 120 or so most were Peter Job, Chief executive of Reuters, James D Wolfensohn, President of the World Bank, Jean Chretien, Prime Minister of Canada and representatives from most of the boards of US and European Banks. Press coverage of these conferences of the super-powerful is virtually nil. The entire meeting is 'off the record' for the mere likes of you or I. They may have moved the core of their interests from Oil to Banking and branched out considerably but the Rockefeller family have not given up the fascination of clandestine operations to keep their business empire beating at the heart of the capitalist machine. Contempt proceedings begun against the Standard in Ohio in 1897 for not obeying the court's order of 1892 to dissolve the Trust - Suits begun to oust four of the Standard's constituent companies for violation of Ohio Anti-trust laws - All suits dropped because of expiration of Attorney-General Monnett's term - Standard persuaded that its only corporate refuge in New Jersey - Capital of the Standard Oil Company of New Jersey increased, and all Standard Oil business taken into new organisation - Restriction of New Jersey law small - Profits are great and Standard's control of oil business is almost absolute - Standard Oil Company essentially a realisation of the South Improvement Company's plans - The crucial question now, as always, is a transportation question - The trust question will go unsolved so long as the transportation question goes unsolved - The ethical questions involved. Few men in either the political or industrial life of this country can point to an achievement carried out in more exact accord with its first conception than John D. Rockefeller, for both in purpose and methods the Standard Oil Company is and always has been a form of the South Improvement Company, by which Mr. Rockefeller first attracted general attention in the oil industry. The original scheme has suffered many modifications. Its most offensive feature, the drawback on other people's shipments, has been cut off. Nevertheless. 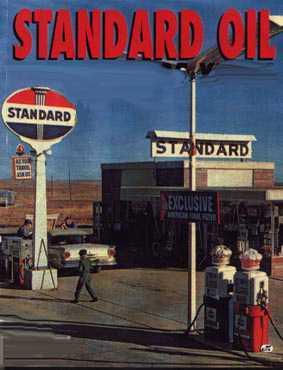 To-day, as at the start, the purpose of the Standard Oil Company is the purpose of the South Improvement Company - the regulation of the price of crude and refined oil by the control of the output; and the chief means for sustaining this purpose is still that of the original scheme - a control of oil transportation giving special privileges in rates. It is now thirty-two years since Mr. Rockefeller applied the fruitful idea of the South Improvement Company to the Standard Oil Company of Ohio, a prosperous oil refinery of Cleveland, with a capital of 41,000,000 and a daily capacity for handling 1,500 barrels of crude oil. And what have we as a result? What is the Standard Oil Company to-day? First, what is its organisation? It is no longer a trust. As we have seen, the trust was obliged to liquidate in 1892. It became a "trust in liquidation, and there it remained for some five years . The only refuge offered in the United States for the Standard Oil Trust in 1898, when the possibility arose by these suits of the state of Ohio taking away the charters of four of its important constituent companies for contempt of court corporation law of the state of New Jersey, which had just been amended, and here it settled. Among the twenty companies which formed the trust was the Standard Oil Company of New Jersey, a corporation for manufacturing and marketing petroleum products. Its capital was $10,000,000. In June, 1899, this capital of $10,000,000 was increased to one of $110,000,000, and into this new organisation was dumped the entire Standard aggregation. The old trust certificates outstanding and the assignments of legal title which had succeeded them were called in, and for them were given common stock of the new Standard Oil Company. The amount of this stock which had been issued, in January, 1907, when the last report was made, was $97,448,800. Its market value at that date was $643,162,080. How it is divided is of course a matter of private concern. The number of stockholders in 1899 was about 3,500, according to Mr. Archbold's testimony to the Interstate Commerce Commission, but over one-half of the stock was owned by the directors, and probably nearly one-third was owned by Mr. Rockefeller himself. The companies which this new Standard Oil Company has bought up with its stock are numerous and scattered. They consist of oil-producing companies like the South Penn Oil Company, the Ohio Oil Company, and the Forest Oil Company; of transporting companies like the National Transit Company, the Buckeye Pipe Line Company, the Indiana Pipe Line Company, and the Eureka Pipe Line Company; of manufacturing and marketing companies like the Atlantic Refining Company of Pennsylvania, and the Standard Oil Companies of many states - New York, Indiana, Kentucky, Ohio, Iowa; of foreign marketing concerns like the Anglo-American Company. In 1892 there were twenty of these constituent companies. There have been many added since, in whole or part, like gas companies; new producing concerns, made necessary by developments in California, Kansas and Texas; new marketing concerns for handling oil directly in Germany, Italy, Scandinavia and Portugal. What the total value of the companies owned by the present Standard Oil Company is it is impossible to say. In 1892, when the trust was on trial in Ohio, it reported the aggregate capital of its twenty companies as $102,233,700, and the appraised value was given as $121,631,312.63; that is, there as an excess of about $19,000,000. In 1898, when Attorney-General Monnett of Ohio had the Standard Oil Company of the state on trial for contempt of court, he tried to find out from Mr. Rockefeller what the surplus of each of the various companies in the trust was at that date. Mr. rockefeller answere: "I have not in my possession or power data showing ... the amount of such surplus money in their hands after the payment of the last dividends." Then Mr. Rockefeller proceeded to repeat as the list of values given six years before. ... There is a later ... trustworthy valuatioin of which the writer knows, and is found in testimony taken in 1889, in a private suit to which Mr Rockefeller was partyl. It is for the year 1896. This shows the "total capital and surplus" of the twenty companies to have bveen, on December 31 of that year, something over one hundred and fortyseven mimllion dollars, nearly forty-nine millions of which was scheduled as "undiedvided profits," Of course there has been a constant increase in value since 1896. The new Stanbdard Oil Company is managed by a board of fourteen directors. They probvably collect the dividends of the constituent companies and divide them among stockholders in exactly the same way the trustees of 1882 and the liquidating trustees of 1892 did. As for the charter under which they are operating, never since the days of the South Imporvement Company has Mr. Rockefeller held privileges so in harmony with his ambition. By it he can do all kinds of mining, manufacturing, and trading business; transport goods and merchandise by land and water in any manner; buy, sell, lease, and imporve lands; build houses, structures, vessels, cars, wharves, docks, and piers; lay and operate pipe-lines; erect and operate telegraph and telephone lines, and lines for conducting electricity; enter into and carry out contracts of every king pertaining to his business; acquire, use, sell, and grant licenses under patent right; purchase, or otherwise acquire, hold, sell, assign, and transfer shares of capital stock and bonds or other evidences of iondebtedness of corporations, and exercise all the privileges of ownership, including voting upon the stocks so held; carry on its business and have ofices and agencies therfor in all parts of the world, and hold, purchase, mortgage, and convey real estate and personal property outside the state of New Jersey. These privileges are, of course, subjerct to the laws of the stae or country in which the company operates. ... A comparison of this summary of powers with those granted by the South Improvement Company shows that in sweep of charter, at least, the Standard Oil Company of to-day has a great power as its famous progenitor. In the East the oil market belonged practically to the Standard Oil Company until recently. Last year (1930), however, Sumatra imported more oil into China than America, and Russia imported nearly half as mush. About 91,500,000 gallons of kerosene went into Calcutta last year, and of this only about six million gallons came from America. In Singapore representatives of Sumatra oil claim that they have two thirds of the trade. Combinations for offensive and defensive trade campaigns have also gone on energetically among these various companies in the last few years. One of the largest and most powerful of these aggregations now at work is in connection with an English shipping concern, the Shell Transport and Trading Company, the head of which is Sir Marcus Samuel, formerly Lord Mayor of London. This company, which formerly traded almost entirely in Russian oil, undertook a few years ago to develop the oil fields in Borneo, and they built up a large Oriental trade. They soon came into hot competition with the Royal Dutch Company, handling Sumatra oil, and a war of prices ensued which lasted nearly two years. In 1903, however, the two competitors, in connection with four other strong Sumatra and European companies, drew up an agreement in regard to markets which has put an end to their war. The "Shell" people have not only these allies, but they have a contract with Guffey Petroleum Company, the largest Texas producing concern, to handle its output, and they have gone into a German oil company, the Petroleum Produkten Aktien Gesellschaft. Having thus provided themselves with a supply they have begun developing a European trade on the same lines as their Oriental trade, and they are making serious inroads on the Standard's market. The naphthas made from the Borneo oil have largely taken the place of American naphtha in many parts of Europe. One load of Borneo benzine even made its appearance in the American market in 1904. It is a sign of what well may happen in the future with an intelligent development of these Russian and Oriental oils - the Standard's domestic market invaded. It will be interesting to see to what further extent the American government will protect the Standard Oil Company by tariff on foreign oils if such a time does come. It has done very well already. The aggressive marketing of the "Shell" and its allies in Europe has led to a recent Oil War of great magnitude. For several months in 1904 American export oil was sold at a lower price in New York than the crude oil it takes to make it costs there. For instance, on August 13, 1904, the New York export price was 4.80 cents per gallon for Standard-white in bulk. Crude sold at the well for $1.50 a barrel of forty-two gallons, and it costs sixty cents to get it to seaboard by pipe-line; that is, forty-two gallons of crude oil costs $2.10, or five cents a gallon in New York - twenty points loss on a gallon of the raw material! But this low price of export affects the local market little or none. The tank-wagon price keeps up to ten and eleven cents in New york. Of course crude is depressed as much as possible to help carry this competition. For many months now there has been the abnormal situation of a declining crude price in face of declining stocks. The truth is the Standard Oil Company is trying to meet the competition of the low-grade Oriental and Russian oils with high-grade American oil - the crude being kept as low as possible, and the domestic market being made to pay for the foreign cutting. It seems a lack of foresight surprising in the Standard to have allowed itself to be found in such a dilemma. Certainly, for over two years the company has been making every effort to escape by getting hold of a supply of low-grade oil which would enable it to meet the competition of the foreigner. There have been more or less short-lived arrangements in Russia. An oil territory in Galicia was secured not long ago by them, and an expert refiner with a full refining plant was sent over. Various hindrances have been met in the undertaking, and the works are not yet in operation. Two years ago the Standard attempted to get hold of the rich Burma oil fields. The press of India fought them out of the country, and their weapon was the Standard Oil Company's own record for hard dealings! The Burma fields are in the hands of a monopoly of the closest sort which has never properly developed the territory, but the people and government prefer their own monopoly to one of the American type! Altogether the most important question concerning the Standard Oil Company to-day is how far it is sustaining its power by the employment of the peculiar methods of the South Improvement Company. It should never be forgotten that Mr. Rockefeller never depended on these methods alone for securing power in the oil trade. From the beginning the Standard Oil Company has studied thoroughly everything at conditions. It has had a keen authoritative sight. It has applied itself to its tasks with indefatigable zeal. It has been as courageous as it has been cautious. Nothing has been too big to undertake, as nothing has been too small to neglect. These facts have been repeatedly pointed out in this narrative. But these are the American industrial qualities. They are common enough in all sorts or business. They have made our railroads, built up our great department stores, opened our mines. The Standard Oil Company has no monopoly in business ability. It is the thing for which American men are distinguished to-day in the world. These qualities alone would have made a great business, and unquestionably it would have been along the line of combination, for when Mr. Rockefeller undertook to work out the good of the oil business the tendency to combination was marked throughout the industry, but it would not have been the combination whose history we have traced. To the help of these qualities Mr. Rockefeller proposed to bring the peculiar aids of the South Improvement Company. He secured an alliance with the railroads to drive out rivals. For fifteen years he received rebates of varying amounts on at least the greater part of his shipments, and for at least a portion of that time he collected drawbacks of the oil other people of that time he collected drawbacks of the oil other people shipped; at the same time he worked with the railroads to prevent other people getting oil to manufacture, or if they got it he worked with the railroads to prevent the shipment of the product. If it reached a dealer, he did his utmost to bully or wheedle him to countermand his order. If he failed in that, he undersold until the dealer, losing on his purchase, was glad enough to buy thereafter of Mr. Rockefeller. How much of this system remains in force to-day? The spying on independent shipments, the effort to have orders countermanded, the predatory competition prevailing, are well enough known.... As for the rebates and drawbacks, if they do not exist in the forms practised up to 1887, as the Standard officials have repeatedly declared, it is not saying that the Standard enjoys no special transportation privileges. As has been pointed out, it controls the great pipe-line handling all but perhaps ten per cent. of the oil produced in the Eastern fields. This system is fully 35,000 miles long. It goes to the wells for every producer, gathers his oil into its storage tanks, and from there transports it to Philadelphia, Baltimore, New York, Chicago, Buffalo, Cleveland, or any other refining point where it is needed. This pipe-line is a common carrier by virtue of its use of the right of eminent domain, and, as a common carrier, is theoretically obliged to carry and deliver the oil of all comers, but in practice this does not always work. It has happened more than once in the history of the Standard Pipes that they have refused to gather or deliver oil. Pipes have been taken up from wells belonging to individuals running or working with independent refiners. Oil has been refused delivery at points practical for independent refiners. For many years the supply of oil has been so great that the Standard could not refuse oil to the independent refiner on the ground of scarcity. However, a shortage in Pennsylvania oil occurred in 1903. A very interesting situation arose as a result. There are in Ohio and Pennsylvania several independent refiners who, for a number of years, have depended on the Standard lines (the National Transit Company) for their supply of crude. In the fall of 1903 these refiners were informed that thereafter the Standard could furnish them with only fifty per cent. of their refining capacity. It was a serious matter to the independents, who had their own markets, and some of whom were increasing their plants. ... The independent refiners decided to compromise, and an agreement terminable by either party at short notice was made between them and the Standard, by which the members of the former were each to have eighty per cent. of their capacity of crude oil, and were to give to the Standard all of their export oil to market. As a matter of fact, the Standard's ability to cut off crude supplies from the outside refiners is much greater than in the days before the Interstate Commerce Bill, when it depended on its alliance with the railroads to prevent its rival getting oil. It goes without saying that this is an absurd power to allow in the hands of any manufacturer of a great necessity of life. It is exactly as if one corporation aiming at manufacturing all the flour of the country owned all but ten per cent. of the entire railroad system collecting and transporting wheat. They could, of course, in time of shortage, prevent any would-be competitor from getting grain to grind, and they could and would make it difficult and expensive at all times for him to get it. It is not only in the power of the Standard to cut off outsiders from it, it is able to keep up transportation prices. Mr. Rockefeller owns the pipe system - a common carrier - and accounting cost for transporting their oil, while outsiders pay just what they paid twenty-five years ago. There are lawyers who believe that if this condition were tested in the courts, the National Transit Company would be obliged to give the same rates to others as the Standard refineries ultimately pay. It would be interesting to see the attempt made. There is no independent refiner or jobber who tries to ship oil freight that does not meet incessant discouragement and discrimination. Not only are rates made to favour the Standard refining points and to protect their markets, but switching charges and dock charges are multiplied. Loading and un-loading facilities are refused, payment of freights on small quantities are demanded in advance, a score of different ways are found to make hard the way of the outsider. "If I get a barrel of oil out of Buffalo," an independent dealer told the writer not long ago, "I have to sneak it out. There are no public docks; the railroads control most of them, and they won't let me out if they can help it. If I want to ship a car load they won't take it if they can help it. They are all afraid of offending the Standard Oil Company." This may be a rather sweeping statement, but there is too much truth in it. There is no doubt that to-day, as before the Interstate Commerce Commission, a community of interest exists between railroads and the Standard Oil Company sufficiently strong for the latter to get any help it wants in making it hard for rivals to do business. The standard owns stock in most of the great systems. It is represented on the board of directors of nearly all the great systems, and it has an immense freight not only in oil products, but in timber, iron, acids, other industries, iron, steel, and copper, and can swing freight away from a road which does not oblige it. It has great influence in the money market and can help or hinder a road in securing money. It has great influence in the stock market and can depress or inflate a stock if it sets about it. Little wonder that the railroads, being what they are, are afraid to "disturb their relations with the Standard Oil Company," or that they keep alive a system of discriminations the same in effect as those which existed before 1887. Of course such cases as those cited above are fit for the Interstate Commerce Commission, but the oil men as a body have no faith in the effectiveness of an appeal to the Commission, and in this feeling they do not reflect on the Commission, but rather on the ignorance and timidity of the Congress which, after creating a body which the people demanded, made it helpless. The case on which the Oil. Regions rest its reason for its opinion has already been referred to in the chapter on the co-operative independent movement which finally resulted in the Pure Oil Company. The case first came before the Commission in 1888. ... The hearing took place in Titusville in May, 1889 ... and in December, 1892, it gave its decision. ... It ordered that the railroads make the rates the same on oil in both tanks and barrels, and that they furnish shippers tanks whenever reasonable notice was given. As the amounts wrongfully collected by the railroads from the refiners could not be ascertained from the evidence already taken, the Commission decided to hold another hearing and fix the amounts. This was not done until May, 1894, five years after the first hearing. Reparation was ordered to at least eleven different firms, some of the sums amounting to several thousand dollars; the entire award ordered amounted to nearly $100,000. See the helplessness of the Commission. It takes full testimony in 1889, digests if carefully, gives its orders in 1892, and they are not obeyed. More hearing follow, and in 1895 the orders are repeated and reparation is allowed to the injured refiners. From that time to this the case passes from court to court, the railroad seeking to escape the Commission's orders. The Interstate Commerce Commission was instituted to facilitate justice in this matter of transportation, and yet here we have still unsettled a case on which they gave their judgment twelve years ago. The lawyer who took the first appeal to the Commission... has been continually engaged in the case for sixteen years! In spite of the Interstate Commerce Commission, the crucial question is still a transportation question. Until the people of the United States have solved the question of free and equal transportation it is idle to suppose that they will not have a trust question. So long as it is possible for a company to own the exclusive carrier on which a great natural product depends for transportation, and to use this carrier to limit a competitor's supply or to cut off that supply entirely if the rival is offensive, and always to make him pay a higher rate than it costs the owner, it is ignorance and folly to talk about constitutional amendments limiting trusts. So long as the great manufacturing centres of a monopolistic trust can get better rates than the centres of independent effort, it is idle to talk about laws making it a crime to undersell for the purpose of driving a competitor from a market. You must get into markets before you can compete. So long as railroads can be persuaded to interfere with independent pipe-lines, to refuse oil freight, to refuse loading facilities, lest they disturb their relations, with the Standard Oil Company, it is idle to talk about investigations or anti-trust legislation or application of the Sherman law. So long as the Standard Oil Company can control transportation as it does to-day, it will remain master of the oil industry, and the peipole of the United States will pay for their indifference and folly in regard to transportation a good sound tax on oil, and they will yearly see an increasing concentration of natural resources and transportation systems in the Standard Oil crowd. If all the country had suffered from these raids on competition, had been the limiting of the business opportunity of a few hundred men and a constant higher price for refined oil, the case would be serious enough, but there is a more serious side to it. The ethical cost of all this is the deep concern. We are a commercial people. We cannot boast of our arts, our crafts, our cultivation; our boast is in the wealth we produce. As a consequence business success is sanctified, and, practically, any methods which achieve it are justified by a larger and larger class. All sorts of subterfuges and sophistries and slurring over of facts are employed to explain aggregations of capital whose determining factor has been like that of the Standard Oil Company, special privileges obtained by persistent secret effort in opposition to the spirit of the law, the efforts of legislators, and the most outspoken public opinion. How often does one hear it argued, the Standard Oil Company is simply an inevitable result of economic conditions; that is, given the practices of the oil-bearing railroads in 1872 and the elements of speculation and the over-refining in the oil business, there was nothing for Mr. Rockefeller to do but secure special privileges if he wished to save his business. Now in 1872 Mr. Rockefeller owned a successful refinery in Cleveland. He had the advantage of water transportation a part of the year, access to two great trunk lines the year around. Under such able management as he could give it his concern was bound to go on, given the demand for refined oil. It was bound to draw other firms to it. When he went int the South Improvement Company it was not to save his own business, but to destroy others. When he worked so persistently to secure rebates after the breaking up of the South Improvement Company, it was in the face of an industry united against them. It was not to save his business that he compelled the Empire Transportation Company to go out of the oil business in 1877. Nothing but grave mismanagement could have destroyed his business at that moment; it was to get every refinery in the country but his own out of the way. It was not the necessity to save his business which compelled Mr. Rockefeller to make war on the Tidewater. He and the Tidewater could both have lived. It was to prevent prices of transportation and of refined oil going down under competition. What necessity was there for Mr. Rockefeller trying to prevent the United States Pipe Line doing business? -only the greed of power and money. Every great campaign against rival interests which the Standard Oil Company has carried on has been inaugurated, not to save its life, but to build up and sustain a monopoly in the oil industry. These are not mere affirmations of a hostile critic; they are facts proved by documents and figures. Certain defenders go further and say that if some such combination had not been formed the oil industry would have failed for lack of brains and capital. Such a statement is puerile. Here was an industry for whose output the whole world was crying. Petroleum came at the moment when the value and necessity of a new, cheap light was recognised everywhere. Before Mr. Rockefeller had ventured outside of Cleveland kerosene was going in quantities to every civilised country. Nothing could stop it, nothing check it, but the discovery of some cheaper light or the putting up of its price. The real "good of the oil business" in 1872 lay in making oil cheaper. It would flow all over the world on its own merit if cheap enough. The claim that only by some such aggregation as Mr. Rockefeller formed could enough capital have been obtained to develop the business falls utterly in face of fact. Look at the enormous amounts of capital, large amount of it speculative, to be sure, which the oil men claim went into their business in the first ten years. It was estimated that Philadelphia alone put over $168,000,000 into the development of the Oil Regions, and New York $134,000,000, in their first decade of the business. ... Indeed, there has always been plenty of money for oil investment. It did not require Mr. Rockefeller's capital to develop the Bradford oil fields, build the first seaboard pipe-line, open West Virginia, Texas, or Kansas. The oil business would no more have suffered for lack of capital without the Standard combination than the iron or wheat or railroad or cotton business. The claim is idle, give the wealth and energy of the country in the forty-five years since the discovery of oil. Equally well does both the history and the present condition of the oil business show that it has not needed any such aggregation to give us cheap oil. The margin between crude and refined was made low by competition. It has rarely been as low as it would have been had there been free competition. For five years even the small independent refineries outside of the Pure Oil Company have been able to make a profit on the prices set by the Standard, and this in spite of the higher transportation they have paid on both crude and refined, and the wall of seclusion the railroads build around domestic markets. Very often people who admit the facts, who are willing to see that Mr. Rockefeller has employed force and fraud to secure his ends, justify him by declaring, "It's business." That is, "it's business" has to come to be a legitimate excuse for hard dealing, sly tricks, special privileges. It is a common enough thing to hear men arguing that the ordinary laws of morality do not apply in business. Now, if the Standard Oil Company were the only concern in the country guilty of the practices which have given it monopolistic power, this story never would have been written. Were it alone in these methods, public scorn would long ago have made short work of the Standard Oil Company, but it is simply the most conspicuous type of what can be done by these practices. The methods it employs with such acumen, persistency, and secrecy are employed by all sorts of business men, from corner grocers up to bankers. If exposed, they are excused on the ground that this is business. If the point is pushed, frequently the defender of the practice falls back on the Christian doctrine of charity, and points that we are erring mortals and must allow for each other's weaknesses! - an excuse, which, if carried to its legitimate conclusion, would leave our business men weeping on one another's shoulders over human frailty, while they picked one another's pockets. The effects on the very men who fight these methods on the ground that they are ethically wrong are deplorable. Brought into competition with the trust, badgered, foiled, spied upon, they come to feel as if anything is fair when the Standard is the opponent. The bitterness against the Standard Oil Company in many parts of Pennsylvania and Ohio is such that a verdict from a jury on the merits of the evidence is almost impossible! An oil producer was discovered stealing oil from the National Transit Company. He had tapped the main line and for at least two years had run a small but steady stream of Standard oil into his private tank. Finally the thieving pipe was discovered, and the owner of it, after acknowledging his guilt, was brought to trial. The jury gave a verdict of Not Guilty! They seemed to feel that though the guilt was acknowledged, there probably was a Standard trick concealed somewhere. Anyway it was the Standard Oil Company and it deserved to be stolen from! The writer has frequently heard men, whose own business was conducted with scrupulous fairness, say in cases of similar stealing that they would never condemn a man who stole from the Standard! Of course such a state of feeling undermines the whole moral nature of a community. The blackmailing cases of which the Standard Oil Company complain are a natural result of its own practices. Man going into an independent refining business have for years been accustomed to say: "well, if they won't let us alone, we'll make them pay a good price." The Standard complains that such men build simply to sell out. There may be cases of this. Probably there are, though the writer has no absolute proof of any such. Certainly there is no satisfactory proof that the refinery in the famous Buffalo case was built to sell, though that it was offered for sale when the opposition of the Everests, the managers of the Standard concern, had become so serious as later to be stamped as criminal by judge and jury, there is no doubt. Certainly nothing was shown to have been done or said by Mr. Matthews, the owner of the concern which the Standard was fighting, which might not have been expected from a man who had met the kind of opposition he had from the time he went into business. The truth is, blackmail and every other business vice is the natural result of the peculiar business practices of the Standard. If business is to be treated as warfare and not as a peaceful pursuit, as they have persisted in treating it, they cannot expect the men they are fighting to lie down and die without a struggle. If they get special privileges they must expect their competitors to struggle to get them. If they will find it more profitable to buy out a refinery than to let it live, they must expect the owner to get an extortionate price if he can. And when they complain of these practices and call them blackmail, they show thin sporting blood. They must not expect to monopolise hard dealings, if they do oil. These are considerations of the ethical effect of such business practices on those outside and in competition. As for those within the organisation there is one obvious effect worth noting. The Standard men as a body have nothing to do with public affairs, except as it is necessary to manipulate them for the "good of the oil business." The notion that the business man must not appear in politics and religion save as a "stand-patter" - not even as a thinking, aggressive force -is demoralising, intellectually and morally. Ever since 1872 the organisation has appeared in politics only to oppose legislation obviously for the public good. AT that time the oil industry was young, only twelve years old, and it was suffering from too rapid growth,k from speculation, from rapacity of railroads, but it was struggling manfully with all these questions. The question of railroad discriminations and extortions was one of the "live questions" of the country. The oil men as a mass were allied against it. The theory that the railroad was a public servant bound by the spirit of its charter to treat all shippers alike, that fair play demanded open equal rates to all, was generally held in the oil country at the time Mr. Rockeller and his friends sprung the South Improvement Company. One has only to read the oil journals at the time of the Oil War of 1872 to see how seriously all phases of the transportation question were considered. The country was a unit against the rebate system. Agreements were signed with the railroads that all rates henceforth should be equal. The signatures were not on before Mr. Rockefeller had a rebate, and gradually others got them until the Standard had won the advantages it expected the South Improvement Company to give it. From that time to this Mr. Rockefeller has had to fight the best sentiment of the oil country and of the country at large as to what is for the public good. He and his colleagues kept a strong alliance in Washington fighting the Interstate Commerce Bill from the time the first one was introduced in 1876 until the final passage in 1887. Every measure looking to the freedom and equalisation of transportation has met his opposition, as have bills for giving greater publicity to the operations of corporations. In many of the great state Legislatures one of the first persons to be pointed out to a visitor is the Standard Oil lobbyist. Now, no one can dispute the right of the Standard Oil Company to express its opinions on proposed legislation. It has the same right to do this as all the rest of the world. It is only the character of its opposition which is open to criticism, the fact that it is always fighting measures which equalise privileges and which make it more necessary for men to start fair and play fair in doing business. Of course the effect of directly practising many of their methods is obvious. For example, take the whole system of keeping track of independent business. There are practices required which corrupt every man who has a hand in them. One of the most deplorable things about it is that most of the work is done by youngsters. The freight clerk who reports the independent oil shipments for a fee of five or ten dollars a month is probably a young man, learning his first lessons in corporate morality. If he happens to sit in Mr. Rockefeller's church on Sundays, through what sort of a haze will he receive the teachings? There is something alarming to those who believe that commerce should be a peaceful pursuit, and who believe that the moral law holds good throughout the entire range of human relations, in knowing that so large a body of young men in this country are consciously or unconsciously growing up with the idea that business is war and that morals have nothing to do with its practice. And what are we going to do about it? for it is our business. We, the people of the United States, and nobody else, must cure whatever is wrong in the industrial situation, typified by this narrative of the growth of the Standard Oil Company. That our first task is to secure free and equal transportation privileges by rail, pipe and waterway is evident. It is not an easy matter. It is one which may require operations which will seem severe but the whole system of discrimination has been nothing but violence, and those who have profited by it cannot complain if the curing of the evils they have wrought bring hardship in turn on them. At all events, until the transportation matter is settled, and settled right, the monopolistic trust will be with us, a leech on our pockets, a barrier to our free efforts. As for the ethical side, there is no cure but in an increasing scorn of unfair play -an increasing sense that a thing won by breaking the rules of the game is not worth the winning. When the business man who fights to secure special privileges, to crowd his competitor off the track by other than fair competitive methods, receives the same summary disdainful ostracism by his fellows that the doctor or lawyer who is "unprofessional," the athlete who abuses the rules, receives, we shall have gone a long way toward making commerce a fit pursuit for our young men. ¹'Study In Power, John D Rockefeller, industrialist and philanthropist', Allan Nevins, pub: Scribners. Chase Bank internal report written by Riordan Roett calling for the elminiation of the Zapatistas. The greatest threat to political stability in Mexico today, we believe, is the current monetary crisis. Until the administration of President Ernesto Zedillo identifies the appropriate policies to stabilize the peso and avoid uncontrolled inflation, it will be almost impossible to address issues such as Chiapas and judicial and electoral reform. Moreover, a prolongation of the crisis, with its negative impact on living standards, raises the issue of labor unrest, specifically, and societal discontent, in general. The inauguration of Ernesto Zedillo on December 1, 1994 as president of Mexico appeared to open a new chapter in the effort to modernize national politics. In his inaugural address, Zedillo stressed the Importance of resolving outstanding political scandals such as the assassinations of 1994; as a guarantee of transparency and he appointed as Attorney General a member of the opposition National Action Party (PAN). The new president called for judicial and electoral reform and for a peaceful resolution of the year-old insurgency in the southern state of Chiapas. He stressed the need for transparency in government and the need to educate and train the Mexican people. Zedillo's cabinet, drawn from the same pool as that of his, predecessor, Carlos Salinas de Gortari, gave the impression of competence and commitment. On December 20, Finance Minister Jaime Serra Puehe, the successful negotiator of the NAFTA during the Salinas years, suddenly announced the devaluation of the peso. In the fall out from that decision, not shared with the international financial community or foreign investors, Serra Puche resigned and was replaced by Guillermo Ortiz. Ortiz had been number two in the Finance Ministry in the Salinas government and had been appointed as the Secretary of Communications and Transport by Zedillo. Ortiz is now in charge of the government's recovery strategy. In our opinion, until the government is successful in stabilizing the peso, avoiding a sharp increase in inflation, and regaining investor confidence, it will be difficult for Zedillo to address the agenda of reforms identified on December 1. There are three areas in which the current monetary crisis can undermine political stability in Mexico. The first is Chiapas; the second in the upcoming state elections; and the third is the role of the labor unions, their relationship to the government and the governing PRI. While Zedillo is committed to a diplomatic and political solution to the stand-off in Chiapas, it is difficult to imagine that the current environment will yield a peaceful solution. Moreover, to the degree that the monetary crisis limits the resources available to the government for social and economic reforms, it may prove difficult to win popular support for the Zedillo administration's plans for Chiapas. More relevant, Marcos and his supporters may decide to embarrass the government with an increase in local violence and force the administration to cede to Zapatista demands and accept an embarrassing political defeat. The alternative is a military offensive to defeat the insurgency which would create an international outcry over the use of violence and the suppression of indigenous rights. President Zedillo, in his inaugural address, restated his commitment to opening the electoral system to opposition parties. This has been a principal issue between the PRI-dominated government and the PAN and the PRD in recent years. The more conservative wing of the PRI has opposed political liberalization while the Zedillo group has argued that an opening is both inevitable and justified. The current monetary crisis opens the question of whether or not Zedillo and the reformers will have the capacity to honor the outcome of local elections in 1995. The conservatives will argue that the crisis justifies the continued one-party rule even if it must be maintained by fraud. The opposition, which generally contests PRI electoral victories regardless of the validity of PRD claims, will be emboldened to continue to do so. Zedillo will be faced with a difficult situation in which he will need to neutralize the conservative members of his own party while maintaining his commitment to allow the opposition to win when they do so legitimately. Elections will be held this year in the states of Jalisco, Guanajuato, Yucatan, Michoacan, and Baja California. three will hold both state congressional and gubernatorial elections. Michoacan will vote only for a state congress and Guanajuato only for a governor. In all of the states, the opposition is historically strong and has a history of reacting strongly to electoral fraud, real or perceived. The government's electoral strategy in 1994 was based on holding together core PRI supporters with the prospects of employment, an increase in real wages, and more spending on public works. The monetary crisis makes it highly unlikely that the PRI can adapt that strategy to the 1995 electoral cycle. Moreover, while the PRI probably won over some opposition votes with its perceived economic success story in 1994, it is unlikely that they will gain any opposition ballots in 1995. The Zedillo administration will need to consider carefully whether or not to allow opposition victories if fairly won at the ballot box. To deny legitimate electoral victories by the opposition will be a serious setback in the President's electoral strategy. But a failure to retain PRI control runs the risk of splitting the governing party. We believe that the ability of the Zedillo administration to resolve the inherent conflicts in the 1995 electoral agenda will be instrumental in determining whether or not the government will be able to fulfill its pledge to liberalize Mexican politics. The labor movement has been the backbone of the PRI for decades. The willingness of labor leadership to take its cues from the PRI has been a fundamental part of the stability in Mexico since the 1930s. The current monetary crisis threatens to undermine that support because of the negative impact on living standards and wages. The fall in value of the peso severely under cuts the capacity of the average Mexican worker to purchase the bare necessities of life each day. In preparing the emergency economic program announced by President Zedillo on January 3, 1995, the most difficult negotiations were apparently with the labor unions who feared the impact on their membership of the hardships required if the program is to be successful. In September 1994, the unions had signed an agreement with the government and business that allowed a seven percent wage increase for 1995. That agreement also included income-tax credits for the lowest-paid workers and some productivity bonuses in contracts. The seven percent wage package was considered a fair deal then because the government estimated that inflation would be only four percent in 1995. With the loss of purchasing power and rises in prices resulting from the peso's devaluation, government economists now think inflation might reach fifteen percent in 1995, and some economists say it will exceed twenty percent. Mexican workers still have not recovered the standard of living they had in 1980, now three devaluations ago. The new agreement signed January 3, 1995 retains the seven percent wage increase. In exchange, the government pledged to minimize price increases and keep inflation from spiraling. Under the agreement, the lowest-paid workers will get a tax credit equal to as much as three percent of income. The government has promised to expand to 700,000 people government-funded scholarships for worker training. In our opinion prolonged continuation of the current crisis will result in pressures to reopen the agreement and compensate Mexican workers for their loss of purchasing power prolonged continuation of the current crisis will result in pressures to reopen the agreement and compensate Mexican workers for their loss of purchasing power. The first indication of this occured on January 11, when the Mexican Confederation of Labor called on its affiliates to demand an immediate 15.3 percent salary increase for January and a 56 percent increase for the rest of 1995. The strong corporatist links between government and unions have weakened in recent years. While the administration still retains influence, it does not have total control. If the crisis continues, the Zedillo administration may be faced with the options of either rejecting worker demands for higher wages and facing the possibility of demonstrations or yielding to worker demands which will further aggravate the economic situation. The Mexican monetary crisis has overshadowed the commitment of the Zedillo administration to a new wave of political reforms that include political negotiations to resolve the Chiapas crisis and to guarantee fair elections at the state and municipal levels. It also raises the issue of whether or not the Mexican working class will accept a prolonged period of wage losses and diminished living standards. These social and political questions, which are of high priority to the President, will inevitably be postponed until the economic situation is clarified. To the degree that the Zedillo government is unable to stabilize the peso and avoid inflation, in our opinion, it runs the risk of social and political uncertainty.